Because of potential rain during this week's playdate, we will have to postpone the pool date! 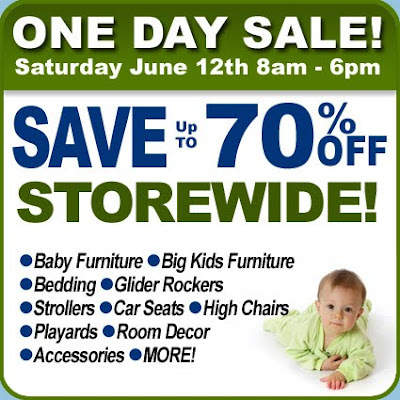 Instead we will be heading to Fun Fore All in Cranberry Township to check out Ballocity! When: Wednesday, June 23rd, 3:30 pm. Ballocity is the areas most amazing kids play area. It’s three stories of fun for the whole family. Each level has something different that adds up to over 30 interactive things to enjoy. There is something for all ages to enjoy, even parents!! And it’s big enough for adults to get in on the fun also. There is also a separate toddler area for the little ones. When we heard that the new Troy Hill Spray Park was up & running, we definitely had to go check it out! About 15 different water features. It is cement, so I would recommend having water shoes. Toys are welcome and a lots of kids were having fun with buckets! There is a park next door. All in all, it is an awesome free summer activity! I am sure we will be visiting this park as a playdate sometime soon, but you can check out more info here! South Side Works cinema shows FREE family-friendly films on Tuesday mornings at 11 am during the summer. Seating is limited, and available on a first-come first-serve basis. Looking for more super-cheap kids movies this summer? Check out Summer Movie Clubhouse for Kids! 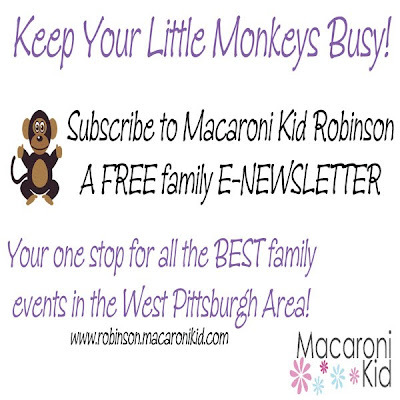 Macaroni Kid Robinson is a family friendly e-newsletter sent directly to your inbox each week! It lists the local events in our area that are specifically for families! 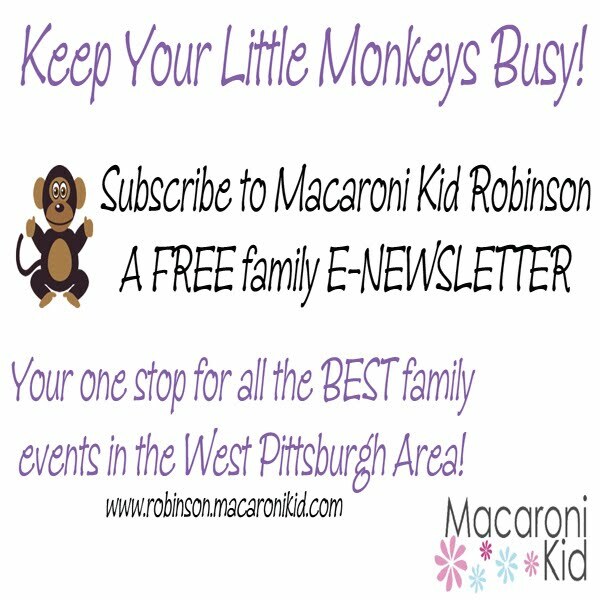 There's no need to go searching around on 100 sites for things to do anymore [except stopping by Pgh Momtourage, of course]! :) They also have tons of great contests, giveaways and parenting articles in addition to the events listings! Go here to check it out & sign up! Strike up the band! This premier North Side event kicks off with a colorful parade marching to the the beat of the Perry High School Marching Band and continues for a full day of adventure and exploration at Riverview Park! A soaring rock climbing wall serves as the centerpiece of this day of free family activities. Kids test their climbing skills as they scale the 32-foot structure. Then explore the landmark Allegheny Observatory, hailed as one of the major astronomical research institutions of the world. Or set off on the extensive network of wilderness trails that attract hikers, joggers and horseback riders year round to this grand regional park. Throughout the park grounds, kids unleash their creativity at the Citiparks Roving Art Cart, explore nature at the Frick Environmental Center hands-on adventure, greet favorite mascots, ride ponies and horses, and much more. The Department of Public Safety's brave men and women in blue provide an interactive/educational experience for kids and families. And everyone enjoys free refreshments. Sponsored by NewsRadio 1020 KDKA. For more information call 412-255-2493 or click here for directions. Big Sale at USA Baby! USA Baby and Child Space in Pittsburgh carries all of your favorite brands; Baby’s Dream, Berg, Bonavita, Million Dollar Baby, Munire, Stanley’s Young America, Britax, Graco, Cocalo, Cotton Tale, Glenna Jean and Robeez just to name a few. Don’t forget to sign up for eMom Rewards to enjoy special club only savings. Our current welcome gift for signing up is a free $20 Gift Card, click here to register. Grab a blanket or lawn chair and head out for an unforgettable evening of free cinema under the stars. The 2010 "Dollar Bank Cinema in the Park" schedule will include The Blind Side, How to Train Your Dragon, Up, Michael Jackson’s This Is It and many other current movie favorites for all members of the family. Return to your favorite movie location at Flagstaff Hill, Riverview Park, Grandview Park in Mt. Washington, Arsenal Park in Lawrenceville, Brookline Memorial Park, East Liberty or West End/Elliott Overlook. For more information, call 412-422-6426 or click here for a full schedule. 93.7 The Fan on-site with prizes and activities! NewsRadio 1020 KDKA on-site with prizes and activities! Our next playdate is this Wednesday, June 9th @ the Pittsburgh Zoo & PPG Aquarium. We will meet just inside the pay booth at 10 am. Be sure and bring your lunch (or you can purchase one as well). Please RSVP so we know to look for you, hope to see you there! Catch a wave and join us for an afternoon packed with free fun for everyone! Enjoy live entertainment and cool activities to jump-start summer reading for the whole family. Avoid the registration lines! Register ahead here.